Disclosure: I received product from M-D Building Products for this post. All views and opinions expressed in this post are my own. You can read my disclosure statement. 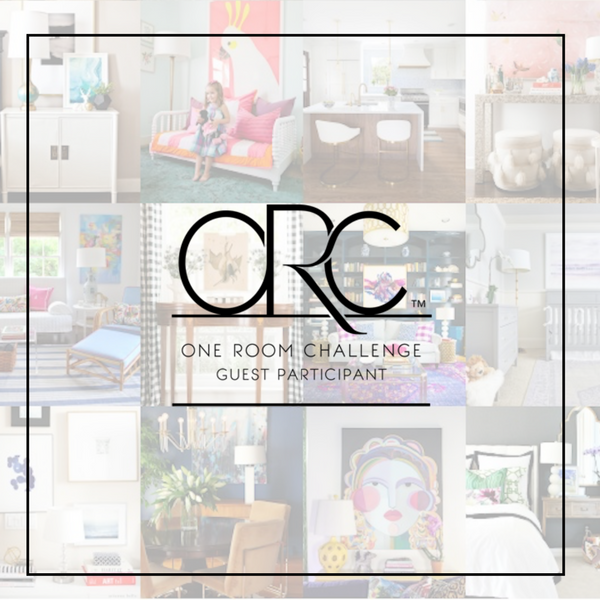 It’s another week of the One Room Challenge hosted by Calling It Home . With all the weather issues around the country, for the first time in the history of the challenge, we have been granted a one week extension. This lucky break could’t have come at a better time. Our son was on leave from over seas, and in all honesty, I wanted to soak up every single moment with him versus working on my One Room Challenge. He flew out last Sunday so now I am busy getting caught up in our teen age son’s room. For this week I partnered with a family owned business called M-D Building Products. Inspired by a need for weatherstripping in his home, L.A. Macklanburg launched his business back in 1920 with his lead salesman, H.M. Duncan. From there the Macklanburg-Duncan Company was born. Their products have been American Made ever since. 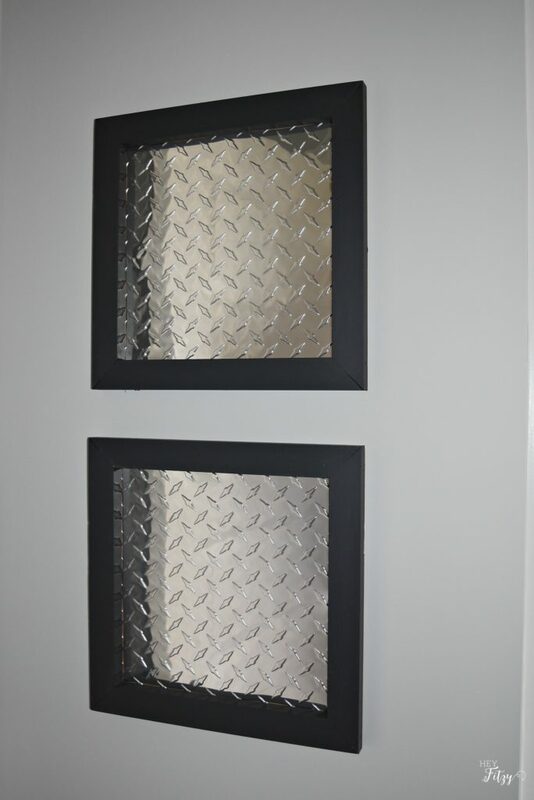 While the company still specializes in weatherstripping, they also make some neat aluminum sheets that can be used to create a number of fun household project. 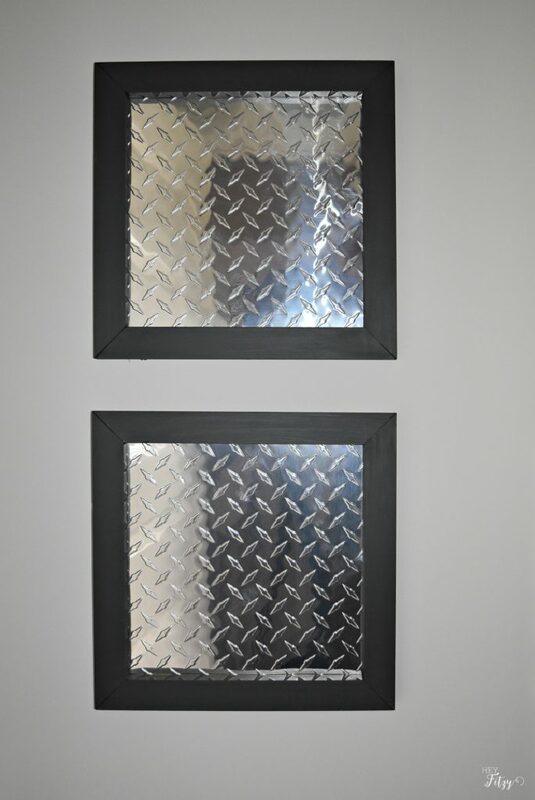 For my son’s room I used a 12×24 inch piece of the diamond tread aluminum sheet. This stuff can be used on high traffic surfaces or for industrial floors and stair treads. 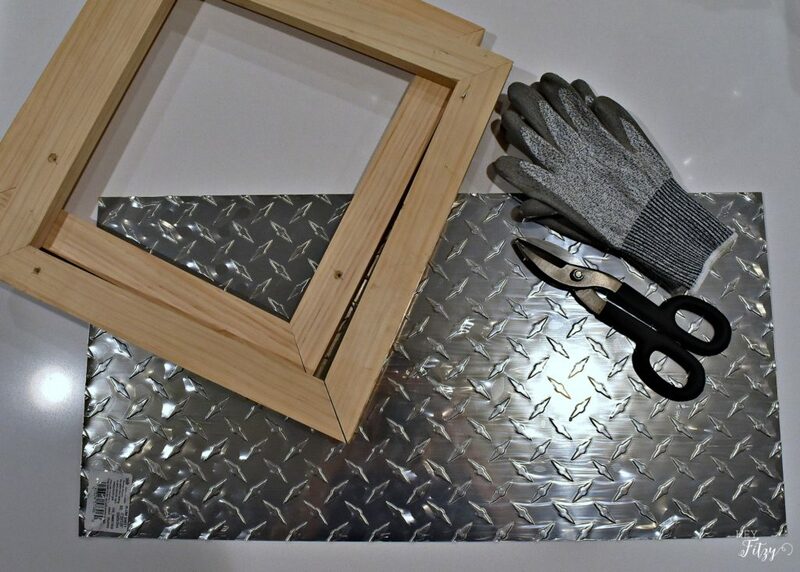 I thought it would be neat to make some simple picture frames to hold the aluminum sheets. This will go well with the industrial vibe going on in the room as well as some art work that will be going up next week. I can’t tell you how easy it was to make these fun little frames. Using left over 1×2 wood from our shop, Fitzy quickly cut the proper angles and used his name gun to put them together. 8 quick cuts and the frames where together in no time. We used wood filler to fill the holes left in the wood from a prior use. Next I gave the picture frames a quick coat of Sherwin- Williams Iron Ore that I used on our Accent Barn Wall. The M-D tin snips made cutting the aluminum sheet a breeze. I wanted each sheet to be 12×12 inches so I used a permanent marker and drew a straight line on the back of the metal. Then carefully made my cut. I also used the M-D hobby gloves to protect my hands as the edge of the metal can be sharp. Using my staple gun, I simply stapled the back corners of the aluminum sheet to the picture frame. The staple hugs the corners to keep the metal in place. The final step was to add a little picture hanger that I found at a local craft shop. We hung the frames as you walk into our son’s room. They add a nice amount of visual interest and texture to the little wall. Here is a little peak of the picture frames with the accent barn wall in the back ground. 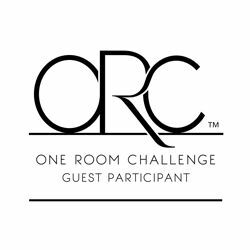 The final reveal is quickly approaching for the One Room Challenge and we have a few more projects to complete. Fingers crossed I can get it pulled together in time. You go girl, those are super cool looking! Good luck finishing up! Thank you Jillian! Getting so excited to finish this space! That's a really fun idea Tammy, I bet they are magnetic too! Hi Nicki, We thought they would be magnetic but they are not. I think he is gonna use washi tape to add pictures. Thank you Emy! My son is super excited to see his room come together. I love the look of these metal sheets. What a unique project! I have some of the decorative sheets that I need to do this with! Hi Mary, I truly love them. So easy to work with the sheets and endless project possibilities! Thank you Lynn! Our son is super excited about the way his room is coming together. And...three weeks with our oldest did this momma's heart good! Tammy, This is such a clever way to get the industrial look and it is going to be perfect with that accent wall treatment. I can't wait to see the entire room. I know you will pull it together in time because you are awesome like that! Hi Sherry, Thank you for the vote of confidence. I was feeling nervous just this morning about trying to get it finished on time. :) So thankful for the extra week. This is a perfect use of metal sheet. I am planning to use this in my son's room and he is so excited about it. Thanks for sharing..!! Hi John, Thank you for stopping by! 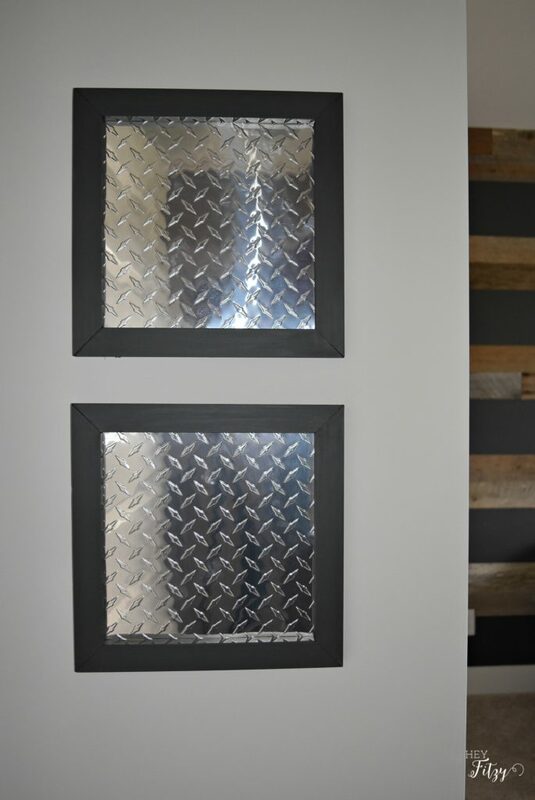 It truly is amazing what can be done with metal to create cool accents in a home! P.S. I checked out your site! You have created some amazing projects!!! What a neat accent for his room, those are awesome!! So glad to hear you got to spend time with your other son, that is much more important than this challenge. I can't wait to see the final reveal!! Thank you Susanne! I was just trying to keep everything in perspective and time with my son was certainly number one. But now I am frantically trying to get caught up to finish in time. So thankful for the extra week! Thank you Jen! It was a fun little project that my son loves!!! such a cool idea! I'm so glad you got some extra time with your son too! I'm sure you're loving having him home. Thank you Kate! We don't get to see him very often so we are always delighted when he gets to take leave! PERFECT idea for a boy's room! So cool!